Recent excavations in the prehistoric deposits at Drakaina Cave, Poros Kephalonia, have brought to light successive layers of Late Neolithic I (or Late Neolithic: 5400-4900 cal BC) and Late Neolithic II (or Chalcolithic: 4900-3700 cal BC) date (Stratouli 2007, Stratouli and Metaxas 2008). Well-organized and systematic sampling of the excavated prehistoric deposits for environmental data has yielded great amounts of plant macrofossils amongst which wood-charcoals are the most abundant. The wood-charcoal material on which the present report focuses represents the majority of the excavated squares, a large number of contexts and the totality of the stratigraphic sequence where three major chrono-cultural phases have been identified, i.e. Late Neolithic, Late Neolithic/Chalcolithic and Chalcolithic (G. Stratouli, pers. comm.). In the majority of excavated units (each unit has a unique 4-digit number) the wood-charcoal samples were separated from the sediment by using both dry-sieving on site and the water flotation method of a large number of soil samples from different contexts. Therefore, the wood-charcoal material subjected to analysis includes both the remains recovered directly from the sediment and those separated from the coarse flot and the residue fraction of the water flotation samples. By these means, we believe that we have achieved the best possible representation of wood-charcoal material per excavated unit. The qualitative and quantitative wood-charcoal results (Table 1) are presented in a preliminary form as assemblages corresponding to each one of the three major chrono-cultural periods, i.e. the Late Neolithic, the Late Neolithic/Chalcolithic and the Chalcolithic. A finer resolution and correlation of the wood-charcoal assemblages with each one of the four lime plastered floors that have been identified at the cave’s sequence (Karkanas and Stratouli 2008) must await a more detailed stratigraphic and contextual analysis. A total of 2793 wood-charcoal pieces have been analyzed and they have produced a rich plant list in which conifers, evergreen and deciduous broadleaved taxa are represented. Furthermore, among the identified taxa we can distinguish between those that would probably grow to form the tree level of the formations, the components of the understorey (bushes and shrubs) and possible climbers. 1. A large number of both evergreen and deciduous species would have grown in the gorge. The frequency of occurrence of the identified taxa shows that Phillyrea and both evergreen and deciduous oaks would have been the most abundant. The oaks and occasionally Aleppo pines would have constituted the tree-level of the formations. A very rich understorey is represented by a large number of smaller trees and shrubs among which strawberry tree, turpentine tree and the almond hold a special place. 2. The mixed evergreen and deciduous formations would have been dense while the steepness of the gorge slopes would have probably had some effect on the distribution of the plant species. We may postulate that deciduous oaks, hop hornbeam, maple, ash and elm might have grown in greater numbers in the shadier and more humid lower part of the gorge where deeper soils would have formed. Most evergreen taxa, the heliophilous Prunus species, turpentine tree and various Labiatae and Leguminosae shrubs would have formed a dense cover on the stonier and sunnier upper part of the slopes. 3. Riverside vegetation would have grown at the bottom of the gorge and along the watercourse. Some indication of this may be seen in the presence of poplars, elms and ash. However, the representation of such vegetation in the Drakaina Cave wood-charcoal assemblages is very low. A reason for this might be the fact that riverside species are usually restricted to a narrow belt along the water course. Moreover, the steepness of the slopes would have probably made difficult the gathering of firewood at the bottom of the gorge and its transportation up-slope. 4. The presence of bay in the charcoal assemblages of Drakaina Cave is in agreement with the present distribution of Laurus nobilis on Kephalonia (Boratynski et al. 1992) and testifies to the long history of this species on the island. 5. The presence of the olive in the charcoal assemblages of Drakaina Cave is worth mentioning given that so far it is one of the few earliest in Greek territory. The taxon has been identified in Late Neolithic I levels and can thus be dated to the late 6th millennium cal BC. The only other earlier evidence, from late 7th millennium cal BC levels, comes from the Aegean, the Cave of the Cyclops, Youra (Ntinou forthcoming). The presence of the olive in mixed formations in the gorge is interesting for the implications it may have in explaining the absence/low presence of the species during the earlier part of the Holocene. It is possible that the species grew in small numbers in special microenvironments, such as gorges, where it had found refuge during the Pleistocene and it did not become a prominent feature of the vegetation until much later and only through cultivation. It is interesting at this point to mention that such a scenario has been proposed for the late appearance of the olive in Crete (Moody et al. 1996) while it is probable that the species might have grown in very small numbers in deciduous oak woodland (cf. Bottema 1990). 6. An interesting aspect of the Drakaina Cave plant list is the presence of the black pine and the possible presence of the Kephalonia fir (under examination for confirmation). They are both mountain conifers, at present growing on Mount Ainos, which boarders the broader area of the Poros gorge to the west. Both species are very sporadic at Drakaina Cave probably because they were growing at a distant location. 7. The wood-charcoal assemblages show a very rich plant environment. The following reasons may be responsible for the vegetation picture we get from Drakaina Cave: a) various microenvironments would have existed within the gorge that would have offered optimal conditions for the growth of a great number of species, b) Kephalonia due to its geographical location to the west of the great Pindus massif and its southern latitudinal position enjoys favorable climatic conditions with a mean annual rainfall between 750-1000 mm and mild winter temperatures (January average 10-15o C) (Polunin 1980, 14-19), c) the Atlantic period climatic optimum favoured the maximum extension and the richest composition of the Holocene plant formations. 8. The qualitative and quantitative results of the Drakaina Cave wood-charcoal assemblages do not show significant changes from the Late Neolithic to the Chalcolithic. The plant formations show a similar composition as far as the most abundant and dominant species are concerned (Fig. 1) while the majority of the secondary components are present diachronically. The above-mentioned climatic and environmental parameters might have played their role in preserving the dynamic and rich ecosystems. However, we believe that the main reasons should be looked for in the frequency, continuity and intensity of human presence in the gorge and the type of activities that the cave accommodated. We may propose that the preservation of the vegetation for over a millennium of human presence at the cave indicates that either its use as a habitat was discontinuous and quite sporadic or that it was used for specialized activities other than animal keeping. The latter seems improbable since it would have caused some changes to the vegetation. In agreement to this is the lack of even microscopic remains of animal dung that precludes the possibility of stabling activities (Karkanas and Stratouli 2008). Furthermore, the lack of evidence for food processing and storage (Sarpaki forthcoming) and the small number of floors (Karkanas and Stratouli 2008) indicate that the cave was not a regular habitation site and its use was taking place at intervals and for short periods of time. As far as other specialized activities are concerned, the wood-charcoal results cannot help clarify whether the cave was used as a hunting site or a place of periodically significant social activity as it has been proposed (Stratouli and Metaxas 2008). The large quantities of wood-charcoal may be seen in relation to phosphate alterations observed on the floor surfaces that can be attributed to the processing of animal products (Karkanas and Stratouli 2008). The abundant use of firewood for meat processing and food preparation would have taken place in the case of specialized hunting expeditions, in social gatherings and feasting or a ritual combination of the two. Whatever the case, such activities would be periodical and spaced in time and therefore, no matter how large quantities of firewood would have been needed in each occasion, they would overall have caused little alteration to the surrounding vegetation. 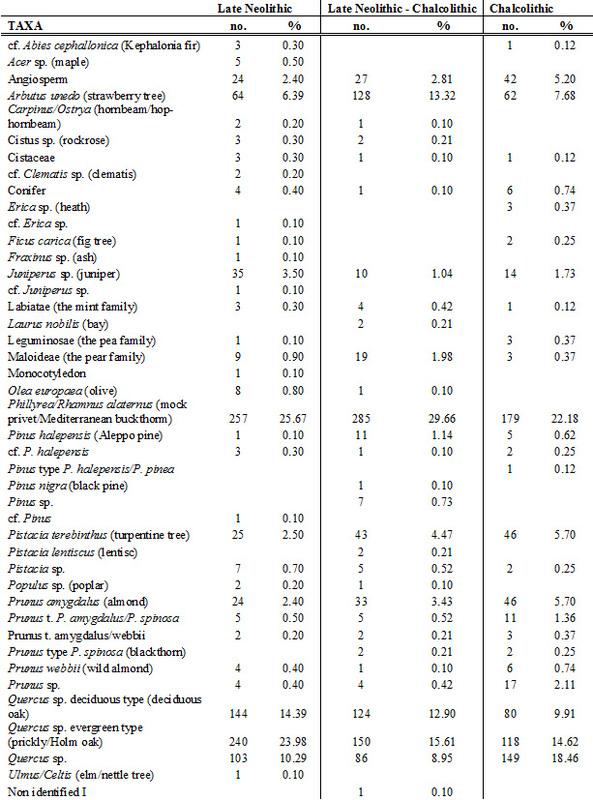 Table 1: Qualitative and quantitative results of the Drakaina Cave wood-charcoal assemblages. 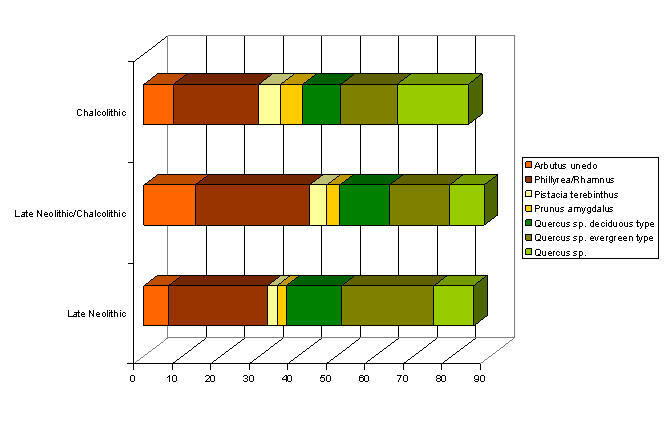 Figure 1: Frequency of the most abundant plant taxa in the wood-charcoal assemblages of the three chrono-cultural periods identified in the Drakaina Cave sequence. Boratynski A., Kazimierz B. and Zielinsky S. (1992) - Chronology of trees and shrubs in Greece. Polish Academy of Sciences, institute of Dendrology. Bottema S. (1990) - Holocene Environment of the Southern Argolid: A Pollen Core from Kiladha Bay. In Wilkinson T.J. and Duhon S.T. (eds), Excavations at Franchti Cave 6, Indiana University Press, p. 117-138. Karkanas P. and Stratoiuli G. (2008) – Neolithic Lime Plastered Floors in Drakaina Cave, Kephalonia Island, Western Greece: Evidence of the Significance of the Site, BSA 103, p. 27-41. Moody J., Rackham O., and Rapp G. (1996) - Environmental Archaeology of Prehistoric NW Crete, Journal of Field Archaeology 23, pp. 273–297. Ntinou M. (forthcoming) - Charcoal Analysis at the Cave of the Cyclops, Youra, Northern Sporades. In Sampson A. (ed.) Τhe Cyclops Cave on the island of Youra, Greece. Mesolithic and Neolithic Networks in the Northern Aegean Basin, vol. 2, INSTAP Monograph Series. Sarpaki A. (forthcoming) - Drakaina Cave at Poros in Kephalonia: A preliminary report on the progress of the archaeobotanical research. In G. Stratouli dir., Drakaina Cave on Kephalonia island, Western Greece. A place of social activity during the Neolithic, INSTAP Academic Press. Stratouli G. (2007) - Tracing the Ionian Neolithic: The contribution of recent excavations in Drakaina Cave, Poros, Kephalonia (in Greek with a summary in English), in G. Arvanitou-Metallinou dir., Prehistoric Corfu and its adjacent areas. 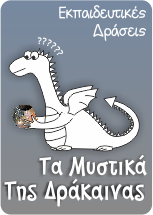 Problems - Perspectives, Proceedings of the Meeting in Honour of Augustos Sordinas, Corfu 17 December 2004, Corfu, Hellenic Ministry of Culture, p. 105-126.